Our principal objective is to promote the fulfilment of fundamental and human rights in Finland. We are the only general human rights organisation that monitors the overall human rights situation in Finland. Our values are based on respect for all people, equality, and justice. The Finnish League for Human Rights is a rights-based expert organisation basing its work on the United Nations Declaration of Human Rights, international human rights instruments and the fundamental rights guaranteed under Finnish Constitution. The FLHR is a religiously and politically independent general human rights organisation. See more detailed information on our operating rules and principles, the 2015 Annual Report and the 2016 Operating Plan. Everyone’s human rights are not fulfilled in Finland. We prevent the violations of human rights by influencing the authorities, conducting research, informing on the human rights and training for example the police officers, teachers, and students. We are an expert organisation. We conduct continuous research on fundamental and human rights issues. 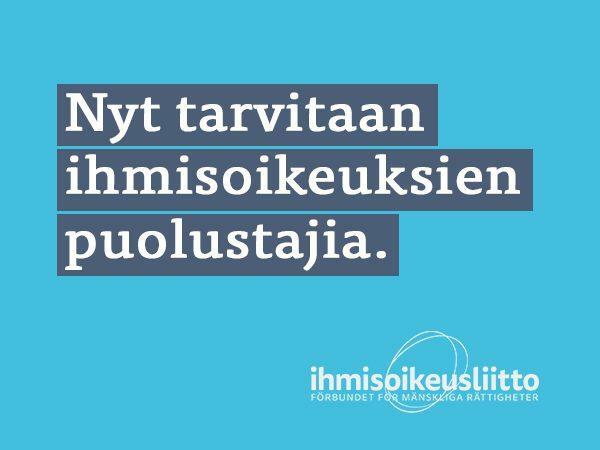 For example, we study the realization of victims’ rights and the exploitation of foreign workers in Finland. We work to improve the legal protection of victims of discrimination and to increase corporate accountability. The FLHR is a Finnish member of the International Federation for Human Rights (FIDH). In cooperation with our international partners we promote i.a. the protection of human rights defenders. We prevent harmful traditions and the related human rights violations in cooperation with the migrant organisations. In addition, we work with the Roma organisations to end the discrimination against the Roma. KokoNainen / The Whole Woman project prevents the circumcision of girls living in Finland. The aim is to change attitudes and raise awareness via group discussions of the fact that the circumcision of girls is a human rights violation and against the Finnish legislation. The Whole Woman also aims to prevent honour-related violence. In cooperation with other organisations we coordinate the Ihmisoikeudet.net web site directed to professional educators. The web site offers a wide basic knowledge on concepts related to human rights, their history, and the international human rights instruments. In addition, the web site offers diverse training materials. In addition to the members and donors, the activities of The FLHR are funded by the Ministry of Education and Culture, Ministry of Foreign Affairs, and the Finnish Slot Machine Association (RAY). The predecessor of The FLHR, The League for Human Rights, was established in 1935 to oppose the restrictions on freedom of expression and to promote civil and political rights. The activities of The LHR were considered harmful to the state and its registration was submitted to the court to be judged in 1936. Although the organisation was not prohibited, its activities waned after the trial and ended completely in 1939. The League for Human Rights was revived in 1949, and its operation was characterized by an intense political orientation towards the Finnish People Democratic League. Protection of workers’ rights was seen as the primary purpose of the organisation. However, the organisation ceased to exist in 1952 due to financial reasons. In the year 1979, In Advocacy of Human Rights and Civil Liberties organisation was established, and Tapio Varis was elected as its first chairman. The purpose of the new organisation was to promote the fulfilment of human and civil rights. In the first year of the operation, the first Human Rights bulletin was also published. The bulletin was sold for three marks. The organisation got its own premises in 1980. The operation took shape during the 1980s as awakening debate over human rights and gathering together and serving the experts and enthusiasts in the field. The scientists and journalists widely used the office’s library. The organisation changed its name in 1986 to The Finnish League for Human Rights and Civil Liberties and in 1993 into its current form The Finnish League for Human Rights. In 1993 also the first issue of Human Rights Report magazine was released, and the magazine was published for nearly two decades. From the current projects, The KokoNainen / The Whole Woman project began its work in 2002, focusing on the prevention of girls’ circumcision; the KITKE! project in 2010, for preventing conflicts related to honour; and the Roma project in 2012. In cooperation with other non-governmental organisations, The FLHR has maintained the Ihmisoikeudet.net web site since 2004, which spreads information on human rights. The number of employees in The Finnish League for Human Rights has grown throughout the 2000s. The need for domestic human rights work has not diminished over the years. On the contrary, it has become more current than ever.